Océ VariaDot™ imaging technology for superior print quality. 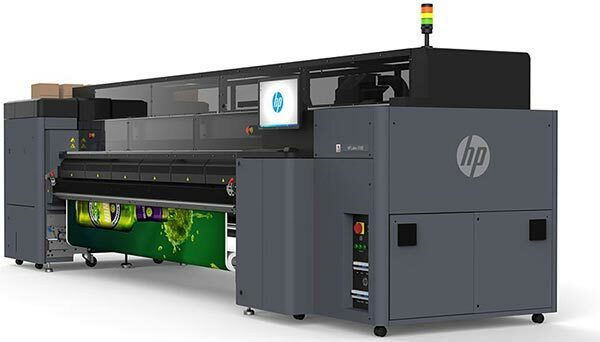 A new 6-colour Océ VariaDot™ imaging technology produces ink droplets from 6 to 42 picolitres resulting in superb image detail, smooth colour transitions and vivid, uniform solid colours. Light Cyan and Light Magenta are used for reliable printing at production print speeds, and improve the smoothness of quarter tone colours, like skin tones. 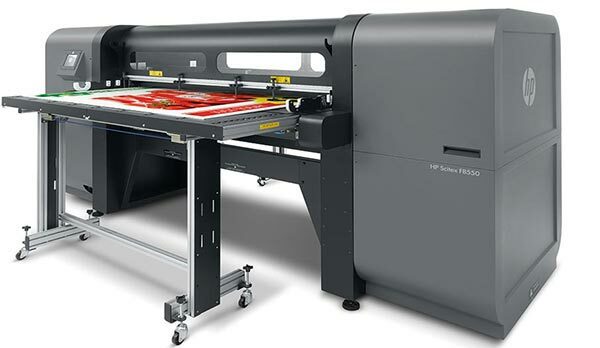 The print sharpness and print geometry over the entire flatbed is further enhanced by actively mapping the table and adjusting the pixel placement, called Active Pixel Placement Compensation. A dedicated, true flatbed system, the Océ Arizona 6100 Series opens up a wealth of production possibilities. 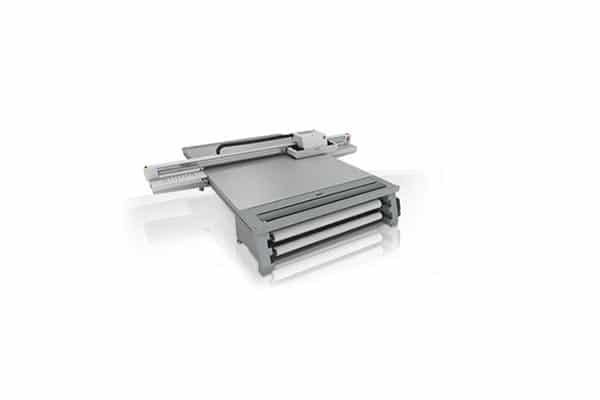 An extra-large 2.5 x 3.05 m vacuum table, designed to keep media and objects stationary during printing, offers optimal print quality and unrivalled versatility. 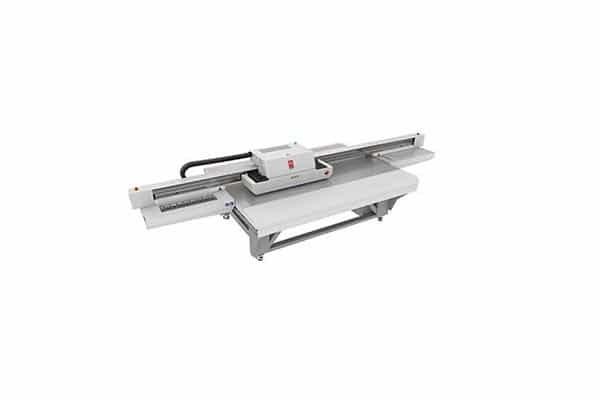 It supports the broadest range of rigid media applications including: printing on odd shaped, heavy, smooth or pre-cut rigid media; high value multi-layer applications; double-sided prints; large tiled prints over multiple boards; and edge-to-edge prints – all in perfect register and geometry and without hassle or mess. 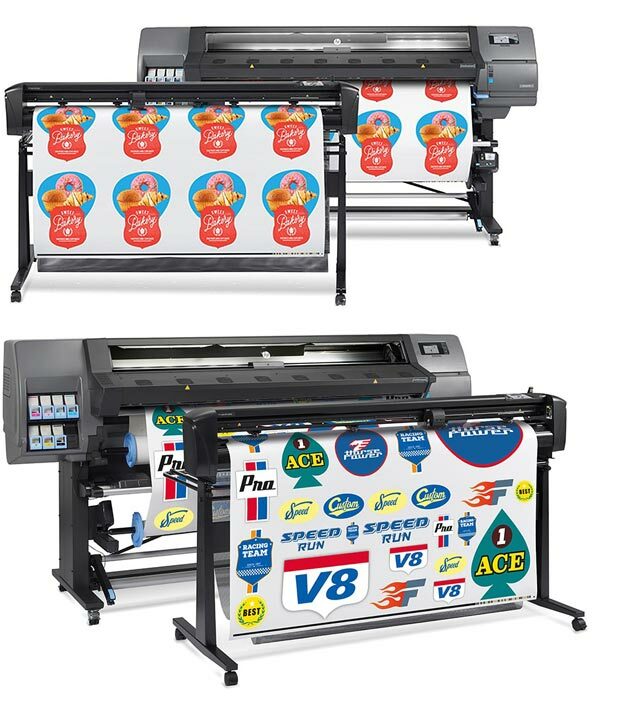 The Océ Arizona 6160 XTS can easily be upgraded at any time to an Océ Arizona 6170 XTS by adding an additional ink channel for white ink support. An API (application programming interface) allows for easy integration with third-party automation systems for instance for automated media load/unload systems. 6 x 636 nozzle printheads per channel, 6 colour channels, 22,896 nozzles in total. Océ VariaDot® grayscale imaging technology. 6-42 picolitres resulting in near-photographic image quality and perfect 6-pt text. Océ IJC261 UV curable inks: Black, Cyan, Magenta, Yellow, Light Cyan, Light Magenta in 3 litre, quick-exchange pouches. 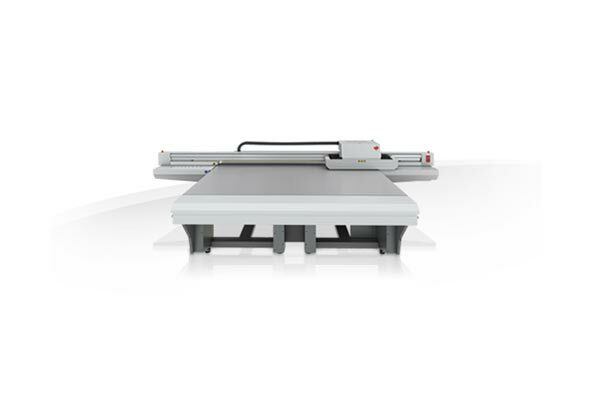 True flatbed architecture designed and build for optimised printing on rigid or sheet media or objects. 2.50 m x 3.05 m x 50.8 mm. 2.51 m x 3.06 m, edge-to-edge printing (full bleed). ±0.8 mm max error, measured over 2.5 m.
±1.0 mm max error, measured over 3.05 m.
0.7 mm max error, measured over 2.5 m.
0.7 mm max error, measured over 3.05 m.
1.0 mm max error, measured over 3.05 m x 2.5 m.
±1.0 mm max error, measured over 3.08 m.
0,7 mm max error, measured over 2,5 m.
0.7 mm max error, measured over 3.08 m.
1.0 mm max error, measured over 3.08 m x 2.5 m.
ONYX® Thrive™ v11.1 or greater. Three-phase, 200-240 VAC 50/60Hz 30A (Delta) OR Three-phase, 347-415 VAC 50/60Hz 20A (Wye). – Air regulator (set to 105 psi / 723 kPa). – ½ inch OD air tubing – connects air regulator to printer. – Pressure (max): 120 psi / 827 kPa. – Peak flow: 340 l/m at 100 psi / 690 kPa. – Continuous flow: 28l/m at 100 psi / 690 kPa. Temperature: 18˚ to 30˚ C.
30-70%, non-condensing (certain media may require a smaller RH operating range). 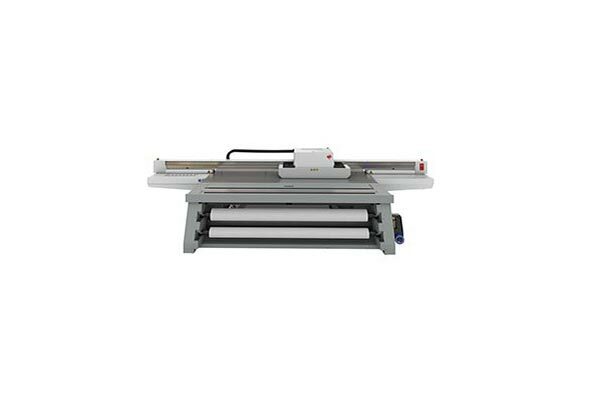 Printer only: 5.72 x 4.82 m.
Table height range (Min/Max): 0.895 to 0.915 m.
Weight (printer only): 1,815 kg. Visit our online guide to find the right media for your printer and application, including matching Océ colour profiles. Colour Channel Upgrade – add colour channel functionality to the printer at any time. Field upgradeable to an Océ Arizona 6170 XTS model configuration – adds White ink functionality for transparent, backlit and non-white media applications. 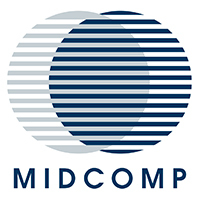 – Versatile rigid media applications. – Océ VariaDot™ imaging technology for superior print quality. – Automated printhead maintenance system. – Pneumatic media registration pins. 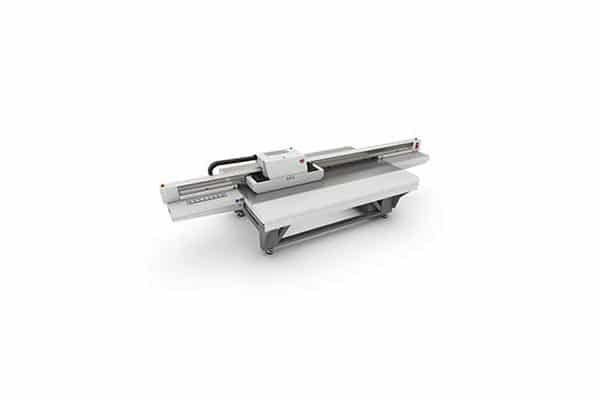 For a quote on the Océ Arizona 6160 XT please send us your contact details and we will get in touch with you soon.